Biometric time attendance system technology brings efficiency to the workplace by keeping better tabs on the employees in a given workforce. Punch cards can be handed to friends so that truant workers can make away with stolen paid company time and employees who make a living from the road or at home need ways to prove that they’ve earned their paychecks. With biometric time attendance system solutions employers cut down on time fraud and dutiful employees have hard evidence they deserve all that over time they’ve been putting in. All of that’s not to mention the increased efficiency on an administrator’s end; with automated and accurate attendance records admins can focus on more pressing matters. Standfast Security Systems supplies access control systems for doors in hotels, offices, factories, schools and other multi-occupancy buildings. The systems we supply keep your staff, buildings and assets safe through restricting access to parts of the building through proximity card and fob control, card swipe systems and keypad entry systems using PINs or numeric codes. • You no longer need to change locks or re-issue keys if they are stolen or lost. With an electronic access control system cards or fobs are issued to allow access through controlled doors. If they are lost or stolen, they can be easily de-activated or barred so that it is impossible to gain entry through the door again. • The problem of doors being accidentally left unlocked is removed for good once your access control system is installed. Doors controlled by the system automatically lock once they close. They can also be programmed to be unlocked for certain periods of time if necessary. Matrix COSEC is an enterprise-grade people mobility management solution for organizations covering Time Attendance System, Access Control, Visitor Management, Employee Self Service Portal, Roster Management, Contract Workers Management and Cafeteria Management. Matrix COSEC is an all-integrated solution including hardware devices and a suite of software application modules. Matrix COSEC is a flexible, modular and scalable solution designed for large, medium and small enterprises encompassing up to 1 million users, 65,000 entry points scattered across 1,000 locations. Matrix COSEC is modular in its architecture. The COSEC is built on layered, distributed processing architecture with intelligent components at each level as mentioned in below fig. COSEC door controller is the front-end terminal people access during entry and exit. 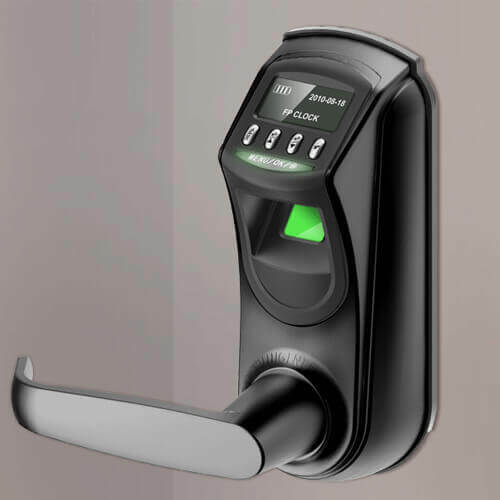 Door Controllers read biometric credentials (fingerprint and palm vein) or RF cards to log each entry/exit and control door lock. Door controllers are connected with the COSEC CENTRA server or site controller. They store all user access information and send entry-exit detail to COSEC CENTRA server in real time. 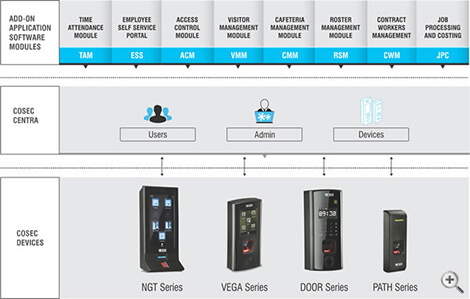 The COSEC door controllers divided into four series as mentioned below. COSEC NGT FCX is a futuristic door-controller to meet the functional and aesthetic needs of any modern organization for access control and time attendance system applications. It’s touch-sense large display facilitates icon based graphical user interface for time attendance system functions for easy and intuitive user interaction. Winner of the coveted iF award for its superior design, DOOR series controllers are versatile devices designed for reliability, modularity and performance. COSEC CENTRA is the heart of the entire COSEC solution. In addition to managing data of the organization, users and devices, it acts as the bridge between the applications and the devices. On the devices side, it facilitates the configuration of devices and communicates with site controllers and door controls to exchange events and commands and show them live on the monitor screen. On the applications side, the CENTRA supports enrolling new users and manages organization and user data. Thus, it is the foundation for applications like Time Attendance System, Access-Control, Visitor Management, Roster Management, Cafeteria Management and others. For 3rd party application developers, it provides API functions to develop applications time-attendance, access-control, visitor management and many others. Matrix COSEC CENTRA Time Attendance system is an enterprise-grade solution for complex organizations with multiple locations spread-across geographic regions. It automates all Time Attendance System and Leave Management processes right from recoding entries and exits up to report generation and salary processing. Matrix COSEC CENTRA ESS is a comprehensive web-based employee portal offering COSEC users to monitor and manage all their Time Attendance system and leave options. Employees and managers can access all their Time Attendance System information easily and perform related tasks intuitively reducing a significant amount of time they spent on these issues. 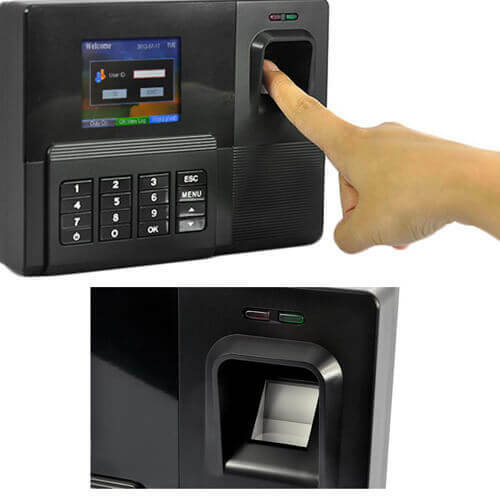 Matrix COSEC CENTRA Access Control protects organization assets and manpower by controlling user’s entry based on their credentials (palm vein, Fingerprint and RF card) and advance access control policies on the door controller. Matrix COSEC CENTRA Visitor Management module automate the entire process of registering a visitor, printing a pass and capturing detailed information in few seconds and greet visitors in a professional manner. Matrix COSEC CENTRA Roster Management is an efficient tool to automate and plan workforce for improving productivity by proper forecasting and budgeting of staffing requirements. This system simplifies the process of defining and managing employee’s duties. Matrix COSEC CENTRA Cafeteria Management software is a completely automated solution starting from placing an order to delivery, including the payment. It allows item tracking, speedy transaction and prevents wastage of food and error in accounting. Matrix COSEC CENTRA Contract Workers Management application is specifically designed for organizations dependent on contract workers. COSEC CENTRA CWM allows managers and contractors to plan and manage their workforce efficiently to improve productivity and significantly reduce labor cost. Organizations can create work orders and assign them to contractors with completion dates. Contractors can manage worker detail and attendance from COSEC web portal. 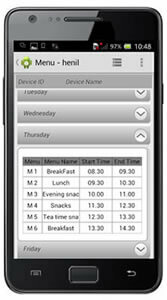 Matrix COSEC MAP is a comprehensive mobile-based employee portal offering COSEC users to monitor and manage all their time attendance system and leave options. Employees and managers can access all their time-attendance information easily and perform related tasks remotely, reducing significant amount of time they spent on these issues. It allows employees to view their attendance and shift schedule, check their leave details, apply for the leave or tour and update personal and job related information.